The leaves are parallel veined, alternate, toothless, thin, and smooth. There are more than 130 varieties of goldenrod. Goldenrod sends out root runners and tends to grow in bunches. It’s pollen is spread by insect activity, not the wind. Loves to grow in open fields and along road sides. Goldenrod likes average to poor, well drained soil, and full sun. I have found some small sweet goldenrod plants on a path through the woods where they must get sunlight for part of the day. Parts used are flowers and flower buds, leaves, and roots. Goldenrod is viewed as a weed in some places, an invasive species in China, and a garden flower in Japan and England. Go figure. You can propagate goldenrod by division. 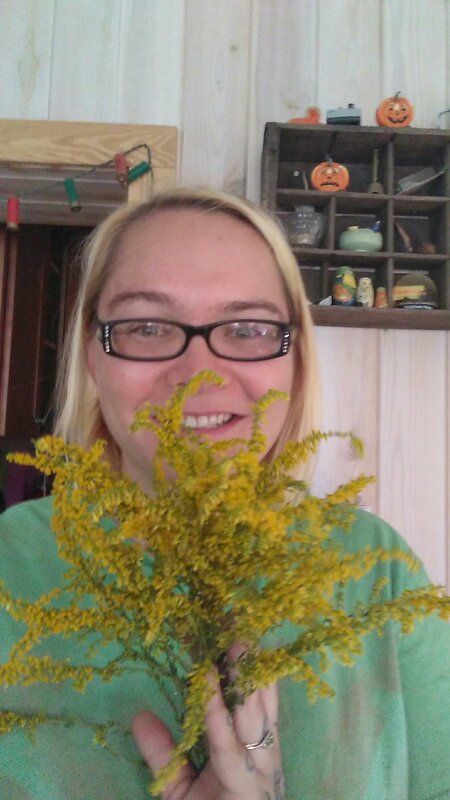 Harvesting goldenrod should happen when the flowers are still vibrant. If you are drying the plant this is more important because the flowers will develop into feathery, fluffy seeds and be hard to dry and store. Generally you should harvest the flowers and several inches of leaves and stems, but leave enough behind for our BFFs, the pollinators. Goldenrod is not on the at risk list. Oil- for treatment of muscle spasms, charlie horses, sore muscles, especially neck and tension headaches. Use fresh flower in high quality virgin olive oil. Also use topically for uterine cramps. Tea – for chronic fatigue and nervous energy. Hot tea can counter allergies, especially pollen based, fevers, sore throats, coughs, colds, and the flu. Cold tea can help with colic in babies and gas in adults. Tea is high in antioxidants. Flower essence- encourages you to be true to yourself and have spine in the face of pressure. Helps support you while making tough decisions. Good for courage, backbone, opening and rebalancing 3rd eye / 6th chakra. Vinegar – improves mineral balance, prevent kidney stones, eliminate flatulence and improve immune functioning. Poultice – styptic to stop bleeding was one use the Cherokee had for goldenrod on the battlefield. Good on wounds generally. Decoction – root can be decocted to treat lower body issues like gout, diarrhea, kidney and bladder issues. Also said that a decoction will fasten teeth loose in the gums. Which is interesting because Traditional Chinese Medicine says kidneys rule the bones and teeth. Indications: red inflamed eyes, bad skin related to suppressed urine or underactive kidneys, atonicity of mucous membranes accompanied by copious dripping and fluid loss and possible low grade infection, cat dander allergies, seasonal allergies – start taking a month before allergy season. Generally can be taken before winter as an immune booster. Tuberculosis, mental weakness, physical weakness, physical exhaustion, upper respiratory catarrh, kidney stones, UTIs, candida – thrush and yeast infections. Contraindications – latex allergy, edema from heart or kidney failure, do not use instead of medical intervention in case of kidney disease or kidney infection. Stems have been used as divining rods. Helpful to the water element. Research on goldenrod and insulin resistance has been done. Ojibwe say the brutal grip of goldenrod roots on the earth is a reminder of needing to prepare for difficult times ahead. “Endure to reach the goal” – Matthew Wood.